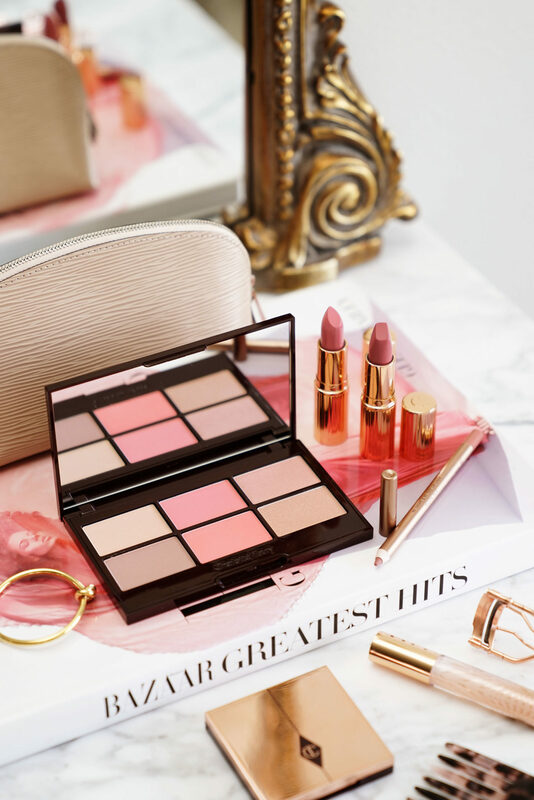 Charlotte Tilbury has a few sets and palettes available for this year’s Nordstrom Anniversary Sale and I hauled two of the items! I picked up the Glowing Pretty Skin Palette ($75) and the Pretty Pink Lipstick Set ($60). 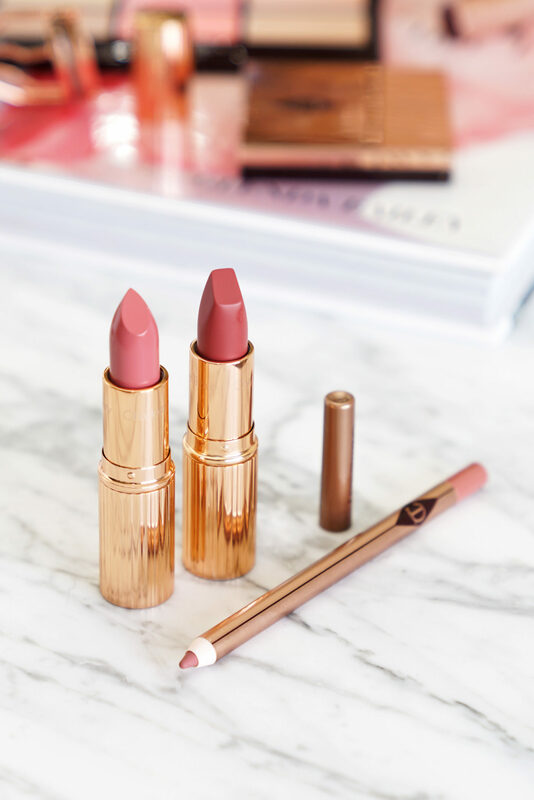 As a long-time Charlotte Tilbury fan I was thrilled to find some new color options for the sale and think both picks are worth checking out. 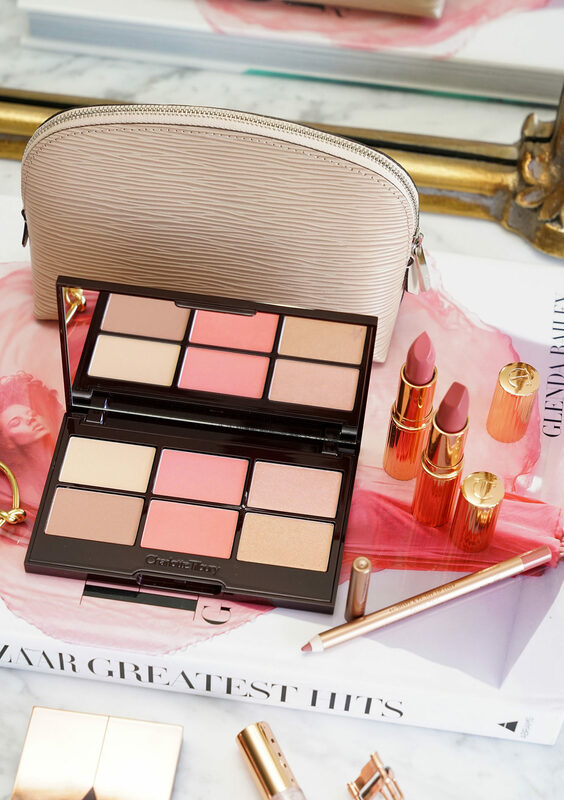 The Glowing Pretty Skin Palette is a mirrored compact with six powders. Each powder is 2.8 g/0.09 oz and the texture is very soft but pigment is visible and smooth. If you’re familiar with her Instant Look Palettes you know they tend to have sheer/natural color payoff. For many of you her first Natural Beauty was really nice in concept but didn’t have enough pigment or color to show up on your skin (it didn’t show up on me). The good news is that this Glowing Pretty Skin Palette is MUCH better and has everything I want in a face palette. Both blushes swatch almost identical on the arm. At first glance I felt it was almost a waste to have 2 of the same color in a palette. You will notice a difference on the face though. The bottom one is more shimmery and a tad more vibrant while the top one is more matte. The overall effect is soft but still noticeable on my medium tan skin. By comparison to the Becca Be a Light Palettes this Charlotte Tilbury one runs more neutral in undertone for the powders and the blushes have more color. Texture and finish of course are completely different. Next is the Pretty Pink Lipstick Set which has three full-sized products in a K.I.S.S.I.N.G Lipstick in Blushing Dream, Matte Revolution Lipstick in Rose Kiss and Lip Cheat Lip Pencil in Pillow Talk. The lipsticks are new and exclusive shades but the lipliner is a repromote of one of her best selling colors. Texture and formula of everything is really good. I’ve reviewed her lipsticks many times before but in case you missed the reviews or are new she has a few different formulas. The K.I.S.S.I.N.G Lipstick is a full coverage, super creamy and very opaque lipstick formula. It can pull on the thick side but all you need to do is blot. They have a natural shine finish and stay put really well. Blushing Dream is a pretty soft pink. She also has a Matte Revolution formula which is one of the few matte lipsticks I love. They’re a luminous matte in the sense they have a matte finish but it doesn’t look or feel dry and they don’t make the lips look like shriveled raisins like some mattes do. I absolutely love them! Rose Kiss pulls very rosy on my lips and on the warm side. Overall thumbs up. I have medium-tan skin and the palette still shows up on my skin in a natural way. If you are lighter than me it will for sure show up and is neutral enough that it won’t pull orangey on your skin. If you are 1-2 shades darker I think it will still show up on your skin but it will definitely be a lot more neutral/flesh toned. I hope she makes more of these because I love the soft natural texture and finish. For the lips nothing would have stopped me from buying the set, but I do think Blushing Dream is really close to The Duchess (reviewed here). Rose Kiss is warmer than I’m used to but I still think it’s a very wearable pretty romantic shade that has color without being too bold. I already own a few of the Pillow Talk Lip Liners, I would have preferred a new shade but the set is priced at a value price. I’m gifting the liner to a friend. 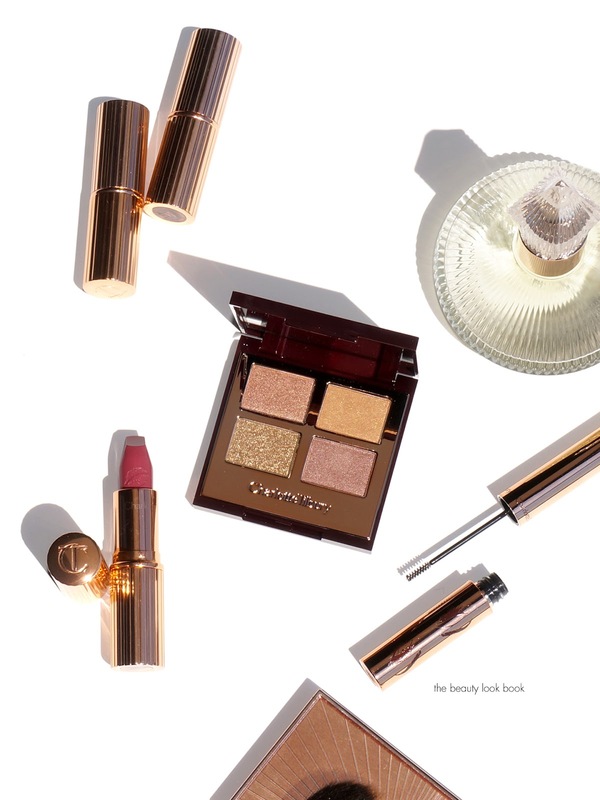 You can find the Charlotte Tilbury Glowing Pretty Skin Palette ($75) and the Pretty Pink Lipstick Set ($60) both exclusively at Nordstrom for the Anniversary Sale. Early Access for the sale is going on until the 20th and then it opens to the public. There is also a set called The Gift of Glowing Skin Set ($75) and Supermodel Body XL Shimmer Shape, Hydrate & Glow ($75). Her body shimmer is one of the prettiest ones I’ve tried but since I rarely wear body shimmers I did not buy this one. 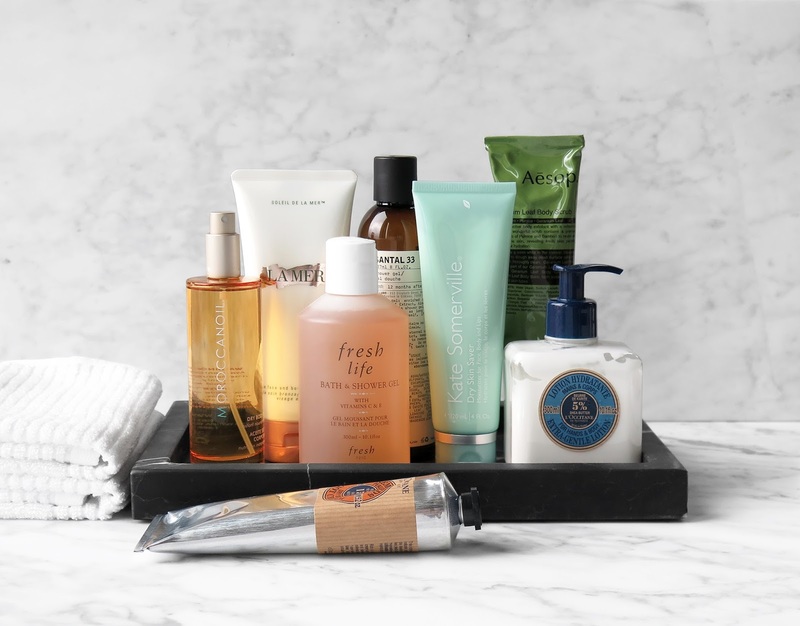 Also be sure to check the Beauty Gift With Purchase page! Have you checked out these sets yet? Are they on your radar?